(This piece was my submission for a writing challenge. The challenge was to use a photograph to trigger a fictional or non fictional piece. 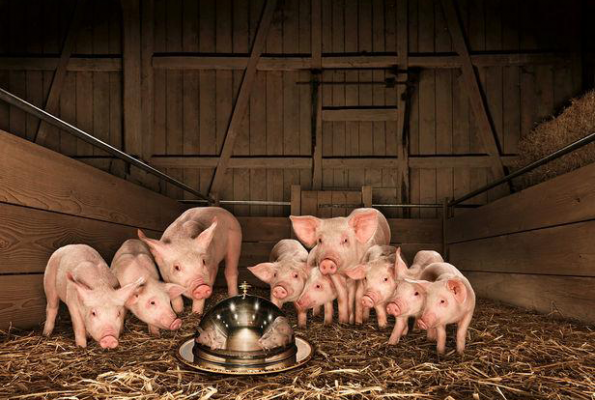 The photograph (of the pigs) that I used to write the article is here. And as you would guess, I have nothing to do with this picture, except use it to trigger the following text). I have read a fair share of farmyard stories, both as a child and as a parent. As a young child exploring the world through books, I loved farmyard stories the most of all – the farmer, the animals, their young ones, the green green grass and the unhurried pace of life depicted in each story. I suppose the place where these stories were set and the pace at which they were told transported me to a world far away – a world so different from mine – a world where nothing was imposed on kids. As a school kid burdened with homework (and other such deadly things like learning to sing in a chorus, tidy up my room and cut & color along dotted lines), I envied the animals for not having to wake up early in the morning, pack a truckload of books in a satchel and sit for hours in classrooms which then seemed too cramped, too small and too boring, compared to the hog pen where baby piglet was born. But at that age, little did I know that the chicken soup that I was fed to soothe a cold a few hours before my farmyard (bedtime) story time came from the same speckled hen that I so adored – the same speckled hen who taught her sunny yellow chicks the value of community and how to stay safe. And shamefully enough, I made point one come true. As a 15 year old, training for bi annual rowing regattas, I decided I ‘needed’ protein power and I sought that power from the animal kingdom. Frankly, I must have razed a few Framer Smith barns to feed my voracious hunger and prove a point about my physical fitness. Also by then, sweet thoughts of baby lamb and loving mother hens were replaced with more young adult thoughts, pursuits and priorities. And I said to myself (with a shrug): ‘that’s how things are’. As absurd as drooling over a calf on television while chewing BiFi, as absurd as coochie cooing with your pet goldfish while frying Mackerel fillets, as absurd as wearing sunglasses at night, as absurd as the picture above – like feeding the pigs table scraps under a cloche. When I mull over this picture, I am confronted with more of this absurdity. Why we love to watch Animal Planet, visit zoos, pet animals, queue up to hand feed animals and then go home and eat ham, bacon or chicken curry still puzzles me. Why we line up our kids in front of the Yorkshire piglets to get a picture that would make us go ‘aaaawww….soooo….cute ’ and then go home and put a suckling pig on spit roast, puzzles me even more. It is just how things are, we tell ourselves. Why we love some animals so much and kill some others after caring for them is still a mystery to me. We mourn the demise of our pet dog for years and yet don’t feel a thing when we see the bloody entrails of a cow in the market. We buy make-believe homes and fancy toys to entertain a pet hamster and we fuss over it when it doesn’t eat fresh fodder but we don’t bat an eyelid when we see chickens cramped in coops and slaughtered. We find working with horses therapeutic and but we send the pigs to the butcher. We book farm stay vacation hoping it would teach our kids to care for animals and also learn live harmoniously with them – but do we also tell the kids that this love is only till hunger strikes? I mean, would we tell them that the steak that Mummy just ate is in fact the hind quarters of the black and white cow the family petted? And we don’t know why. Or maybe we do, but we are afraid to change. The choices we make, our unexamined behavior, attitudes we never pause to review and traditions we pass down seem to be wiping billions of animals from this planet and often very brutally too, but yet we are fine. George Orwell wrote in the Animal Farm ‘all animals are equal but some are more equal than the rest’ to make a point about social stratification and corrupt leadership, but I guess the irony of that statement applies to how we humans regard some animals. This was written by a person who has failed the fourth attempt at vegetarianism but is determined to cross the chasm by eating only aquatic animals for a while – as a sort of stop-over before the destination. The so called ‘sea food’ diet provides a temporary relief for a person who grew up on a strictly non veg diet. The fish, the prawn and the lobsters that I have allowed myself for now are a display of my cowardice, yep, a kind of shock absorber you could say, or a slow weaning off! It is hard for me to sit through gourmet dinners, washing my salad and cheese with a glass of wine – it is even more so, when my mum makes lamb chops. When I make it to the other side (and stay there without looking back), I’ll celebrate with more than just words!